My eyes perked up when I saw this headline “Farm workers to pressure Stop & Shop.” (Stop & Shop is the most prominent Massachusetts grocery chain.) The thrust of the article is a campaign by the Florida based Coalition of Immokalee Workers to increase the price of tomatoes by $0.01 per pound. The article explains the brutal conditions of tomato farm workers, their poverty-level incomes, and their efforts to raise awareness and wholesale prices, in creating a workplace rights code of conduct for retailers to adopt. Apparently a one penny per pound increase would make dramatic improvements in farmworkers’ lives. Workers should target growers–not supermarkets–for increased wages. Yes, that would have been true in 1964, when the customers of Stop & Shop had limited visibility on such matters, and limited ability to respond. This blog alone demonstrates “game-changing.” I’m a Stop & Shop customer, and I am pressing “pause” when I pick up a tomato now. I wonder what kind of house the worker lives in, and whether child labor harvested my perfect Florida tomato. I can’t name a single commercial tomato grower, but I know Stop & Shop and I can act. Anyone with a computer can, efficiently and easily. It is, rather, “There is no such thing as a free lunch. Can campaigns like this farmworker one overcome the huge betrayal people feel towards big businesses and Wall Street to really believe that the cost of something is actually a cost, and not just increasing marketing budgets and executive paychecks?” If these Florida farmworkers can successfully get people to connect what they pay for tomatoes to real human beings, living in their own country, with American-size bills to pay, and dreams for their children like their own, that would be a huge victory. It can roll forward to other common foods. It can roll forward to textiles. It can roll forward to electronics. It can roll forward to all the things we buy that shape our economy, and our world. If something seems too good to be true (Bananas for 20 cents a pound! 50% off on a meal! 70% off on dry cleaning! ), it probably is. Someone, usually the least powerful person in the supply chain, is paying for it. With their time, and their undervalued work, and their desperate livelihoods. That’s the timing shift that can’t come soon enough, in my book. Thank you for caring and bringing this to us. I too will see much more than a vegetable next time I buy tomatoes even though I lived 25 years in Kendall (South Miami) which in 1969 was 100% tomato fields. I saw the migrants come through during the season but never thought much of it…now social media puts a new awareness to it and a new urgency. Unfortunately, even if the campaign is successful, the migrant will still get the short end of the stick since greed will not put that penny in his pocket. And this folks…is my two pennies’ worth! Targeting only the growers in a worker-led campaign for increased wages is like ignoring your supply chain and all the margins that are built into the cost of a tomato at Stop & Shop. EVERYONE in the process has to be accountable to the farmers AND to the consumers. The spokeswoman for Stop & Shop probably needs some retraining on how to validate your consumers’ (or suppliers’) concerns, accept responsibility, and respond appropriately! I was once in a room with my one and only hero Jane Goodall about 10 years ago when someone asked her about how we were supposed to be able to afford organic, sustainable food and consumer goods. What stuck with me of her response was that we can either pay now or pay later. How true is that? We here in America are convinced everything should be cheap as chips. People in other countries spend a FAR higher percentage of their income on food. (Oh, and they usually eat less, too. But that’s another story!) Spend more on real tomatoes and less on Coca-Cola and boxed cereals. Then we’ll all be better off. I have a brilliant coffee table book called _Hungry Planet_ which takes pictures of families and the food contents of their kitchens/pantries. It’s worth looking at sometime just to gain a perspective on how completely twisted our food systems are here in America. Wendell Berry (from Kentucky!) is another eloquent writer on this topic. Check out _Bringing it to the Table_. 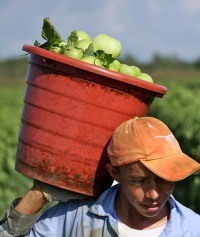 More power to the Florida farmworkers. I do think that the average consumer is starting – albeit slowly – to understand food and consumerism on a grander scale. Perhaps those consumers will see the faces of the human beings behind the campaign and believe that the money indeed will trickle down to the farmers themselves? Non-profit organizations like OXFAM have done this kind of marketing for years and have raised a pretty penny in the process. In the meantime, Stop & Shop’s dumb response just gave me another reason to feel justified in never shopping there even though there’s one within a couple of blocks of my house. “Workers should target growers” is a great way for Stop & Shop to deflect the issue. For workers to do that effectively, they have to be organized. That’s very, very hard; it’s so easy for the growers to just find other workers willing to endure what the original workers did. And people that poor cannot afford to be on strike for a long time; they need whatever pay they can get. We consumers have a lot more flexibility. We can decide which tomatoes to buy; we can put pressure on Stop & Shop. We don’t all have to be in a unanimous organization to have an effect. A one-time march and rally is fine, but I expect Stop & Shop will just shrug it off and assume that even if it gets publicity, their customers will soon forget it. I hope there’s a way to put continual pressure on them in some way, to give them a real incentive to change. @ Dan, Julia and Victor…I maintain optimism about these issues. The Millennial generation really seems to take this stuff to heart…about not wanting to pay later, as Jane Goodall articulated. Greed is indeed timeless, but I do believe it is easier to pursue in a nameless, faceless endeavor. The big change now is what you all are identifying…the ability to humanize these issues with compelling and powerful media (social, video etc.) Thanks for the comments. @ Jules. Not many people are as optimistic as i am on certain things (I have been struggling, pushing, trying, failing, winning and trying to get my first patented invention into the market for 8 years now. I AM optimism!) but on other issues I am very realistic. Let me give you another example…in 1973, during the oil embargo, I did witness the mile-long lines of cars waiting overnight to get gas. Once we got over it we were all optimistic and everybody swore that it would not happen again…it has and is going on right now but without the waiting lines. Seven years later I finished my bachelor’s in Architecture but wanted to continue my studies. I remembered the oil embargo and was fortunate enough that THE world’s foremost authority on passive & hybrid solar applications to architectural design was one of our teachers at the Univ. of Miami…Prof. Arthur Bowen. Sensing continued future oil problems, I set out to do a Master’s with him but U of M did not have a Master’s degree…I got the Dean to start one with me as the sole student. With Prof. Bowen, we held an International Solar Energy Expert Group Meeting every summer inviting 12 to 20 top experts from around the globe to come in and discuss the research/results of their past year’s work. In effect, we were writing THE book on solar energy each and every summer. I finally graduated and remember telling myself…dang, I am five years too early!!! How wrong I was since it is now almost 30 years and we have not even touched the methods that those experts discussed at those meetings so many summers ago. I was optimistic then…now i am realistic and know that greed (due to incompetent/corrupt govt. or big oil) will continue winning. So with all due respect, I disagree with you since we are passing the buck to the new generation to fix what we helped break…as Jothy Rosenberg says “Who Says I Can’t?”…why cant I fix it, why cant I take it on my shoulders and fix one small part of this God forsaken broken system (I already have dibs on one county’s corruption), why can’t each of you take on and fix a small part of your ‘back yard’? WHO says we can’t??? Not me. For the migrant farmers to be helped a new ‘system’ has to be invented (hint)…start a bare-bones independent organization and force (by boycotting) Stop & Shop (and all others) to voluntarily collect and contribute $0.01 per pound of all produce sold and this bare-bones org. distribute these funds directly to the migrants. WE must take back this country and today is easier than ever due to the power of social media.